Mayor Rahm Emanuel announced a new partnership today between Illinois Institute of Technology (IIT) Exelon Corporation and Von Steuben Metropolitan Science Center, a Chicago Public High School (CPS). This unique school-wide STEM (Science, Technology, Engineering and Math) partnership allows qualified students to earn college credits at a four-year university, supporting the city-wide goal of increasing postsecondary success in STEM education and careers. Exelon and IIT’s financial contributions and in-kind support for the program is valued at $2.6 million, $1.5 million and $1.1 million respectively. It will be provided at no cost to Von Steuben students beginning in the 2015-2016 School Year. The goal of the program is to ensure that Von Steuben students have a strong foundation for academic success through school-wide STEM-enrichment experiences supported by IIT, postsecondary preparation and STEM career exposure led by Exelon. The program will provide operational support with a curriculum and an instruction coordinator dedicated to facilitating and supporting the partnership. Von Steuben and IIT will collaborate on planning between faculty at both institutions and professional development to support inquiry-based learning and integrated studies. The partnership goal is to provide at least 300 students over five years with the opportunity to take classes at IIT. The coursework will focus on foundational courses that transfer to degree programs at most universities. The program’s school-wide STEM enrichment opportunities will develop student capacity to use inquiry and persistence in order to think through problems and develop independence for college success. Students will focus on both hard and soft STEM skills needed to succeed in related fields such as collaborative problem solving, design thinking and perseverance. The partnership will also provide students with college readiness experiences, exposing them to college life through campus visits and experiences. They will have increased access to admissions guidance, guest speakers, and STEM-focused summer programming. Using IIT as a point of focus, the program will also help students plan their postsecondary vision. It will match students with academic support and experiences that fit their future goals. This includes providing targeted academic support for success in college-level coursework, utilizing the resources of the university and Von Steuben. “Von Steuben welcomes this exciting partnership that brings innovative opportunities and resources to convey to our students that 'STEM starts here,'” said Von Steuben Principal LeMone. The program will also give Von Steuben Metropolitan Science Center teachers and students a unique opportunity to learn more about Exelon’s businesses through interactions with their employees, internships and field trips to Exelon’s operating facilities. Chicago-based Exelon is the nation’s leading competitive energy provider, with a presence in every stage of the energy business, from power generation to competitive energy sales to energy delivery. 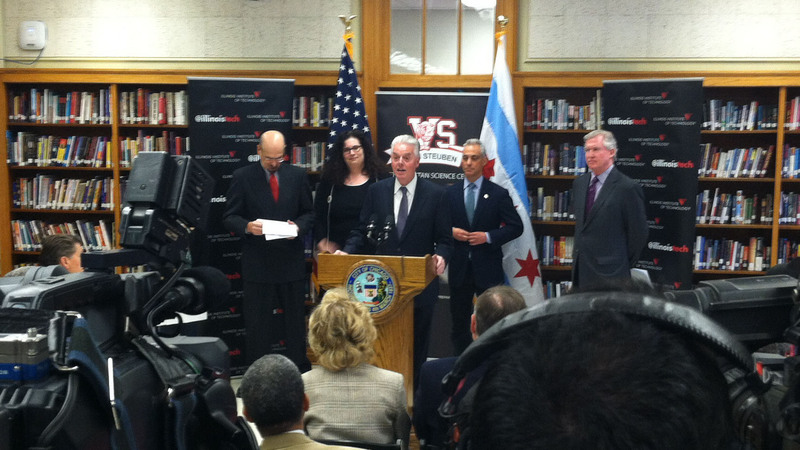 This announcement builds on the success of the City of Chicago’s five Early College STEM Schools (ECSS), which gives students the opportunity to dually earn college credits through the City Colleges of Chicago (CCC). In February 2014, Time Magazine featured ECSS’s partnership agreement with five technology companies, including IBM, Cisco, Microsoft Corporation, Motorola Solutions and Verizon Wireless. Each program has developed a unique curriculum at the partnering school to teach students the skills required in that marketplace, as well as provide mentors and internships. The new Von Steuben and IIT partnership supports Mayor Emanuel’s city-wide strategy to increase access to a high-quality, cradle-to-career STEM education pipeline for students. The city-wide strategy strategically brings together and directs educational, corporate, and philanthropic resources toward the shared goal of increasing STEM opportunities for Chicago students. With the support of multiple sectors, the strategy seeks to triple the number of Chicago students earning STEM credentials by 2018.